Another Beautiful Day in Paradise. We had a brisk NE wind so we headed North on the Trail. We had a good turn out considering Ken & Mikes Halloween Party on Saturday night. Absentees Phil & Cindy and Nancy came. Rick & Ginnie brought friends Jim & Sharon. Jeff B was back from his vacation in China. Welcome all. We basically formed two groups. One group went to the North end of Clearwater and back. Dee indicated they went 11 miles. 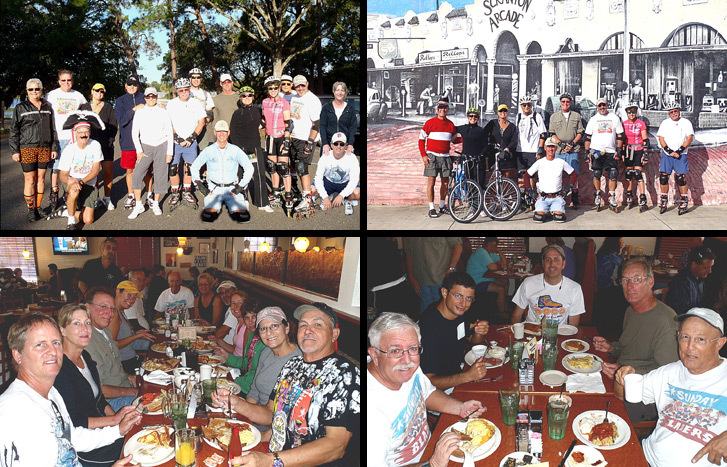 The other group went to Main St. in Dunedin and back and went 17 miles. We had 9 bicyclists. We Brunched at the Savory restaurant as planned. They wouldn't give us reservations over the phone so Janice went ahead and reserved us tables. Thanks Janice. It took a few minutes to get in and we sat at two tables as the 17 mile group got there about 20 minutes after the 11 mile group. The coffee flowed freely and the food was excellent. Rob rated has Brunch a 9.8 and Cindy rated hers a 9.85.